Our bone health changes as we are aging, and so do our muscles and joints. Understanding the effects of the aging process can encourage us to be gentler and kinder to our bodies to prevent problems in the future. There is no denying it, people can lose bone mass and density as they age. Women are particularly susceptible to bone health issues after menopause. The bones tend to lose calcium, as well as other minerals. According to the National Osteoporosis Foundation, about 54 million Americans are affected by osteoporosis and low bone mass, which can lead to an increased risk of fractures. As we get older and our bones are changing, our joints become stiffer and less flexible. It is common to have fluid in the joints or lose cartilage, which is referred to as degenerative changes. Hip, knee and finger joints are common problem areas. Sometimes, these problems can be inherited. Joint changes can lead to pain, inflammation, and even deformity. Some people may develop stooped posture. While the joints are getting stiffer, and some people experience a decrease in lean body mass. This can be caused by a loss of muscle tissue or atrophy. Lost muscle tissue might be replaced with tough fibrous tissues. People who experience this may get tired more easily and have less strength. When it comes to aging bones, each individual’s experience can be slightly different, but there are some common problems, particularly for older women. Here’s a brief outline of the effects of aging on the musculoskeletal system. Osteoporosis – This happens when the bones are brittle and fragile due to hormonal changes or a deficiency in calcium and/or vitamin D. The problem is, it can lead to broken bones. Compression fractures of the vertebrae can reduce mobility and be very painful. Muscle weakness – When muscles are weak, it leads to reduced activity, which can cause further health decline. Loss of muscle tissue also causes fatigue, thus increasing the risk of falling. Risk of injury – As we age, our gait or pattern of walk changes due to changes in bones, joints, and muscles. This can lead to instability and loss of balance, raising the risk of injury from bumping into things, as well as falling. Reduced reflexes – Changes in the muscles and tendons can impact our reflexes. Being able to react quickly in an emergency situation (for example, while driving) may be diminished. Involuntary movements – Muscle tremors and movements called fasciculations are common in older people. In some cases, elderly experience weakness or abnormal sensations. Changes in the musculoskeletal system could be the result of aging or they could have something to do with an underlying disease. 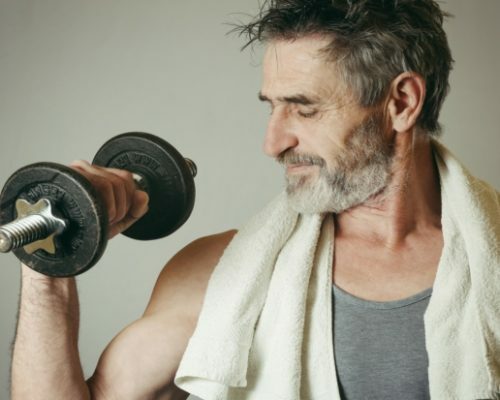 It is interesting to note that less than 10 percent of Americans exercise on a regular basis and the most sedentary group is over the age of 50. Exercise is important to bone, muscle, and joint health. Rheumatologists say, simple stretching is a great way to maintain muscle and joint health. Weight training can help increase muscle mass and strength, which allows people to continue enjoying their daily activities. Research shows that long-term exercise can slow down the loss of muscle mass, as well as reduce the risk of developing high blood pressure and heart disease. About 30 minutes of exercise a day is highly recommended. Exercise routines don’t have to be vigorous. They can include simply walking, swimming, riding a bicycle, or dancing. Some fitness experts even suggest that working in a garden for five minutes counts towards your daily exercise program. Each year, millions of elderly people fall. One out of five of these falls leads to a serious injury, such as broken bones or a head trauma. In many cases, deteriorating bone, muscle, and joint health are to blame. Rheumatologists believe a lot of this falling can be prevented if people maintain a healthy diet and exercise on a regular basis throughout their lives. If you think you are too sedentary, are over 65, and want to start incorporating exercise into your daily routine, it’s best to consult with a doctor before starting. They will be able to give you a sense of what type of exercises you should begin with to keep you motivated and safe.